هدف پژوهش حاضر، بررسی عوامل مؤثر بر قصد استفاده از شبکه‌های اجتماعی در بین کاربران دانشگاهی است. برای رسیدن به این هدف، چهار سازه تجربه جریان [ ارتباطی] (تمرکز، فرار از واقعیات یا رهایی، تعامل اجتماعی و درک لذت) بر قصد استفاده کاربران شبکه‌های اجتماعی بررسی می‌شود. بعد از تدوین مؤلفه‌های پژوهش، داده‌ها با استفاده از پرسشنامه محقق‌ساخته گردآوری شد و برای تجزیه و تحلیل داده‌ها و آزمون فرضیه‌های پژوهش، روش ‌مدل‌سازی معادلات ساختاری مورد استفاده قرار گرفت. 259 نفر از دانشجویان مقطع کارشناسی دانشگاه یزد در سال 1393 به عنوان حجم نمونه انتخاب شدند. یافته‌های به دست آمده از آزمون فرضیه‌ها نشان داد که درک لذت، فرار از واقعیات و تعامل اجتماعی از عوامل تأثیرگذار بر قصد استفاده کاربران از شبکه‌های اجتماعی است. assistant prof. in knowledge and information science, yazd Uni. The present study aims to examine the factors affecting university students' intention behind using social media. To this end, four components of the communicative experience flow (i.e. concentration, avoiding reality, social interaction and understanding pleasure) with respect to the purpose of these networks' users will be explained. The data were collected through a researcher-made questionnaire, and were analyzed by Structural Equation Modeling (SEM). Sum 259 BA students from Yazd University were chosen as the samples in 1393 (Iranian Calendar). The findings indicate that understanding pleasure and joy, avoiding reality and social interaction were among the factors affecting the intention of users for using social networks. اکبری، محسن؛ اصیل نوپسند، سید‌محمد ؛ زاهدفر، کامران و ناصری، سحر. (1393). بررسی تأثیر مجذوب‌شدن و ویژگی‌‌‌‌‌‌‌‌‌‌‌‌‌‌‌‌‌‌‌های وب‌سایت بر رضایت و استفاده کاربران از شبکه‌های اجتماعی (مطالعه موردی: فیس‌بوک). فصلنامه نوین بازاریابی تحقیقات، 4 (2). بازرگان، عباس؛ سرمد، زهره و حجازی، الهه. (1384). روش تحقیق در علوم رفتاری. تهران: آگاه. خدایاری، گلثوم ؛ فاطمه، دانشور حسینی و سعیدی، حمیده. (1393). میزان نوع استفاده از شبکه‌های اجتماعی مجازی (مطالعه موردی: دانشجویان دانشگاه آزاد مشهد). فصلنامه پژوهش‌های ارتباطی، 21 (1)، صص 192-167. About Information Technology Usage. MIS Quarterly,Vol. 24 , No. 4, pp.665-694. Ahn, T.; Ryu, S. & Han, I. (2007). The Impact of Web Quality and Playfulness on User Acceptance of Online Retailing. Information & Management, Vol. 44, No. 3, pp. 263–275. Babin, B.J. ; Darden, W.R. & Griffin, M. (1994). Work and/or Fun: Measuring Hedonic and Shopping Value. 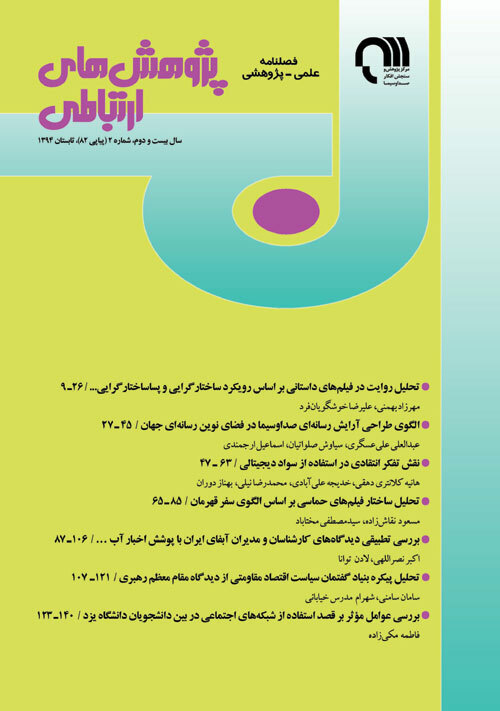 Journal of Consumer Research, 20 (March), pp. 644-656. Bridge, E. & Florsheim, R. (2008). Hedonic and Utilitarian Shopping Goals: The Online Experience. Journal of Business Research, 61, pp. 309-314. Bloch, P.H. ; Ridgway, N.M. & Dawson, S.A. (1994). The Shopping Mall as Consumer habitat.Journal of Retailing, Vol. 70, No. 1, pp. 23-42. Boyd, D. & Ellison, N.B. (2007). Social Network Sites: Definition, History, and Scholarship. Journalof Computer-Mediated Communication,Vol. 13, pp. 210-230. Correa, T.; Hinsley, A.W. & Zuniga, H.G. (2010). Who Interacts on The Web? : The Intersection of Users’ Personality and Social Media Use. Computers in Human Behavior, 27, pp. 247-253. Davis, F.D. ; Bagozy, R.P. & Warsaw, P.R. (1989). User Acceptance of Computer Technology: A Comparison of two Theoretical Models. Management Science, 35, pp.982-1003. Ghani, J.A. & Deshpande, S.P. (1994). Task Characteristics and the Experience of Optimal Flow in Human–Computer Interaction. The Journal of Psychology, 128, pp.381-391. Ghani, J.A. (1995). Flow in Human Computer Interactions: Test of a Model. Human Factors in Information Systems: Emerging Theoretical Bases, pp. 291-311. Hargitta, E. (2008). Whose Space? Differences Among Users and Non-Users of Social Network Sites. Journal of Computer-Mediated Communication, 13, pp. 276-297. Hausman, A.V. & Siekpe, J.S. (2009). The Effect of web Interface Features on Consumer Online Purchase Intentions. Journal of Business Research, Vol. 62 , No. 1, pp. 5-13. Hoffman, D.L. & Novak, T.P. (2009). Flow Online: Lessons Learned and Future Prospects. Journal of Interactive Marketing, 23, pp .23-34. Hsu, C. & Lu, H. (2004). Why do People Play Online Games? An Extended TAM With Social Influences and Flow Experience. Information and Management, Vol. 41, No. 7, pp. 853-868. Huang, M. (2003). Designing Website Attributes to Induce Experiential Encounters. Computer inHuman Behavior, 19, pp. 425-442. Koufaris, M. (2002). Applying the Technology Acceptance Model and Flow Theory to Online Consumer Behavior. Information Systems Research,Vol. 13, No.2, pp. 205-223. Koo, D.M. (2009). The Moderating Role of Locus of Control on the Links Between Experiential Motives and Intention to Play Online Games. Computer in Human Behavior, 25, pp. 466- 474. Lin, C.S. ; Wu, Sh. & Tsai, R. J. (2005). Integrating Perceived Playfulness Into Expectation-Confirmation Model for Web Portal Context. Information and Management, Vol. 42, No.5, pp. 683–693. Lin, Kuan, Yu. & Lu, His, Peng.(2011). Why People Use Social Networking Sites: An Empirical Study Integrating Network Externalities and Motivation Theory. Computers in Human Behavior, Vol. 27, No.3, pp.1152-1161. Luna, D.; Laura, A.P. & Maria, D. (2002). Cross-Cultural and Cognitive Aspects of Website Navigation. Journal of the Academy of Marketing Science, Vol. 30, No. 4, pp. 397-410. Luna, D.; Peracchio, L.A. & De Juan, M.D. (2003). Flow in Individual Websites: Model Estimation and Cross-Cultural Validation. Advances in Consumer Research, 30, pp. 280-281. Mathwick, C.; Malhotra, N. & Rigdon, E. (2001). Experiential Value: Conceptualization, Measurement and Application in the Catalog and Internet Shopping Environment. Journal ofRetailing,Vol. 77, No.1, pp. 39-56. McQuail, D. (2005). Mass Communication Theory: An Introduction. Sage, CA. Novak, T.P. ; Hoffman, D.L., & Yung, Y.F. (2000). Measuring the Flow Construct in On-line Environments: A Structural Modeling Approach. Marketing Science, Vol. 19, No. 1, pp. 22–42. Ross, C.; Orr, E.S. ; Sisic, M.; Arseneault, J.M. ; Simmering, M.G. & Orr, R.R. (2009). Personality and Motivations Associated with Facebook Use. Computer in Human Behavior, 25, pp. 578-586. Sheng, Z.; Jue, Z. & Weiwei, T. (2008). Extending TAM for Online Learning Systems: An Intrinsic Motivation Perspective. Tsinghua Science and Technology, Vol. 13, No. 3, pp. 312-317. Steinfield, C.; Ellison, N.B& . Lampe, C. (2008). Social Capital, Self-Esteem, and Use of Online Social Network Sites: A Longitudinal Analysis. Journal of Applied Developmental Psychology, 29, pp. 434-445. Thelwall, M. (2008). Social Networks, Gender, and Friending: An Analysis of Myspace Member Profiles. Journal of the American Society for Information Science and Technology,Vol. 59, No. 8, pp. 1321-1330. Personal Computers in Homes: Adoption Determinants and Emerging Challenges. MIS Quarterly, Vol. 25, No. 1, pp. 71–102. Wu, Hsiu-Lan. & Wang, Jau-Wen. (2011). An Empirical Study Of Flow Experiences In Social Network Sites. PACIS 2011 Proceedings, p. 215.